Researchers at Beckman Institute have used a novel technique to determine how the brain processes external stimuli that reach (or don’t reach) our awareness. “When we have different things competing for our attention, we can only be aware of so much of what we see,” said Kyle Mathewson, Beckman Institute Postdoctoral Fellow. “For example, when you’re driving, you might … see something brief or faint while you’re paying attention to something else, so the event [such as a truck heading at you] won’t come into your awareness. Mathewson and colleagues are finding out how the brain does this by using a novel technique to test brain waves. Surprisingly, they found that alpha waves — typically only thought of the brain’s electrical activity while it’s at rest — can actually inhibit what is processed visually, making it hard to see something unexpected. Cognitive neuroscientist Kyle Mathewson explains the role alpha waves play in our brains and discusses how portable EEG brain monitors may become an integral part of our daily lives. Mathewson is a Postdoctoral Fellow at the Beckman Institute for Advanced Science and Technology at the University of Illinois at Urbana-Champaign. 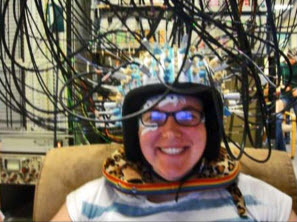 The researchers used both electroencephalography (EEG) and Event-Related Optical Signal (EROS) technology, developed in the Cognitive Neuroimaging Laboratory of Gabriele Gratton and Monica Fabiani, professors of psychology and members of the Beckman Institute’s Cognitive Neuroscience Group, and authors of the study. While EEG records the electrical activity along the scalp, EROS uses infrared light passed through optical fibers to measure changes in optical properties in the active areas of the cerebral cortex. Because of the hard skull between the EEG sensors and the brain, it can be difficult to find exactly where signals are produced. But EROS, which examines how light is scattered, can noninvasively pinpoint activity within the brain. Event-Related Optical Signal (EROS) technology allows researchers to use light to get a nearly real-time look at the neuronal activity inside the human brain. Neuroscientist Carrie Brumback Peltz demonstrates this ground-breaking technique for imaging the brain. This allowed the researchers to map where the alpha oscillations were originating. Their discovery: the alpha waves are produced in the cuneus, located in the occipital lobe, which processes visual information. 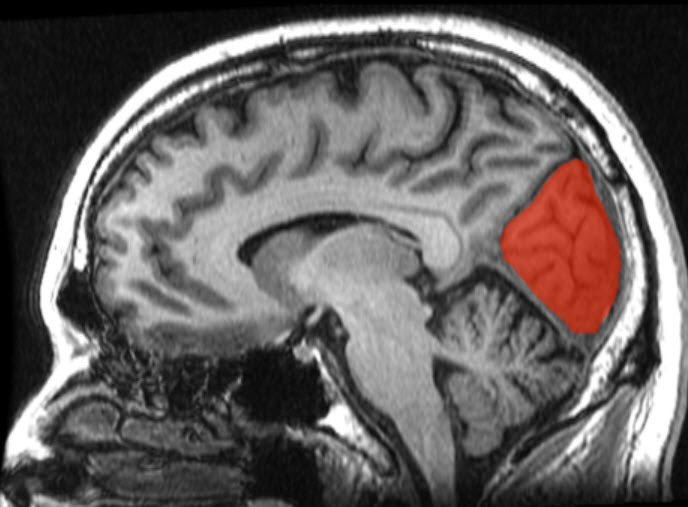 However, by focusing your attention and concentrating more fully on what you are experiencing, the executive function of the brain can come into play and can provide “top-down” control — putting a brake on the alpha waves, thus allowing you to see things that you might have missed in a more relaxed state. “We found that the same brain regions known to control our attention are involved in suppressing the alpha waves and improving our ability to detect hard-to-see targets,” said Diane Beck, a member of the Beckman’s Cognitive Neuroscience Group, and one of the study’s authors. “By understanding the areas of the brain involved in attention, we can monitor this activity and take measures to change it depending on the needs of the current circumstance,” Mathewson explained to KurzweilAI in an email interview. “The path of light through the head is relatively less impeded than the electrical fields are, and therefore this technology can be used to provide much better spatial resolution in identifying the location of oscillatory brain activity. Their work is published in the Journal of Cognitive Neuroscience. Researchers from the City College of the City University of New York were also involved. Funding was provided by the Natural Sciences and Engineering Research Council of Canada (NSERC), the Beckman Institute, and the National Institute of Mental Health (NIMH). We investigated the dynamics of brain processes facilitating conscious experience of external stimuli. Previously, we proposed that alpha (8–12 Hz) oscillations, which fluctuate with both sustained and directed attention, represent a pulsed inhibition of ongoing sensory brain activity. Here we tested the prediction that inhibitory alpha oscillations in visual cortex are modulated by top–down signals from frontoparietal attention networks. We measured modulations in phase-coherent alpha oscillations from superficial frontal, parietal, and occipital cortices using the event-related optical signal (EROS), a measure of neuronal activity affording high spatiotemporal resolution, along with concurrently recorded EEG, whereas participants performed a visual target detection task. The pretarget alpha oscillations measured with EEG and EROS from posterior areas were larger for subsequently undetected targets, supporting alpha’s inhibitory role. Using EROS, we localized brain correlates of these awareness-related alpha oscillations measured at the scalp to the cuneus and precuneus. Crucially, EROS alpha suppression correlated with posterior EEG alpha power across participants. Sorting the EROS data based on EEG alpha power quartiles to investigate alpha modulators revealed that suppression of posterior alpha was preceded by increased activity in regions of the dorsal attention network and decreased activity in regions of the cingulo-opercular network. Cross-correlations revealed the temporal dynamics of activity within these preparatory networks before posterior alpha modulation. The novel combination of EEG and EROS afforded localization of the sources and correlates of alpha oscillations and their temporal relationships, supporting our proposal that top–down control from attention networks modulates both posterior alpha and awareness of visual stimuli.